It first occurred to me to make a countertop out of concrete in 1985, when a friend and I were hired to design and renovate a professor’s house in the Berkeley Hills. He gave us a modest budget and announced, “This is all I can afford to spend; do whatever you want.” Armed with this rare creative license (and plenty of youthful exuberance) we aimed to be as innovative as possible. This invitation to imagine, play, and explore inevitably led me to experiment in my own kitchen, where concrete and I began what is now our nearly two-decade dance. My first concrete countertop was a single piece containing 11 cubic feet of concrete. It weighed nearly 1500 pounds and took 10 people—and 2 engine hoists—to turn it over once it had cured. We barely managed it, but the piece came out beautifully and is still being put to good use today. Armed with a fine arts background and lots of design energy, I channel my creativity through my firm,Cheng Design, and our custom residential design work. Our portfolio includes kitchen and bath design,interior remodels, and complete custom homes. We also happen to be licensed contractors, which means we balance design principles with an understanding and appreciation of craftsmanship. Concrete is our material of choice because its utility and durability are matched by its sculptural sensitivity. Hands-on experience has taught me and my team how to simplify the process and control the variables that affect the finished product. 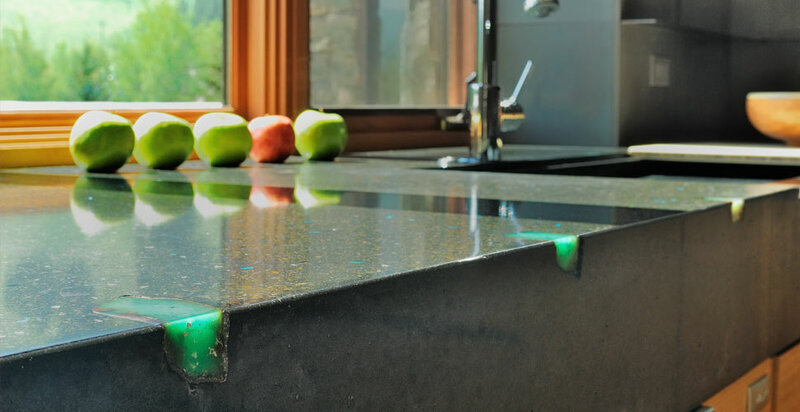 The malleability of this material, and the techniques Cheng Design has developed for manipulating it, make it a perfect choice for any countertop. It’s my hope that Concrete Exchange will inspire more homeowners, artists, designers, architects, and concrete professionals to get their hands dirty and play. I invite you to use the ideas, techniques, resources, and products presented here as a springboard to explore the creative possibilities of this age-old material. We are pleased to share our extensive knowledge, built on years of concrete design exploration and technical experimentation, and to offer our proprietary line of CHENG Concrete Countertop Products—plus all the accessories, tools and instructional products you’ll need to make beautiful, long-lasting professional or DIY concrete projects. Surrender to the impulse… carve your initials in concrete.